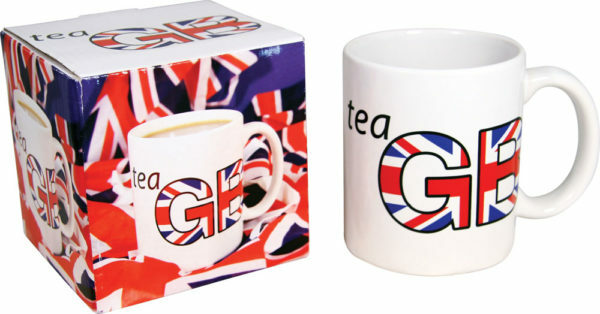 Show your support for the British sport of tea-drinking with this ‘tea GB’ stoneware mug. There’s no spelling mistake, this mug is for all lovers of the great British brew. The ‘tea GB’ mug holds approximately 300 ml/10 fl oz and is suitable for both dishwasher or microwave use. The ‘tea GB’ mug has the wording ‘tea GB’ with the GB proudly emblazoned with the Union Jack on both sides of the mug so everyone will be able to see you’re carrying out your patriotic duty every tea break. The ‘tea GB’ mug is standard sized and measures 95 mm in height and 80 mm in diameter. The ‘tea GB’ mug comes in its own attractive gift box and will make a great present for anyone keen to show their allegiance to the nation’s favourite beverage.